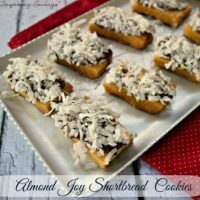 These coconut-chocolate-almond-topped shortbread Almond cookies are the ideal Almond Joy Cookies that you are craving. These bars are actually easy to put together and will disappear even quicker. My kids couldn’t get enough of these and kept begging for more. Shortbread cookies are a favorite in our house. They are addicting. I blame the flaky, buttery base of this cookie. Is your mouth watering now? Combining favorite flavors like chocolate, almond, and coconut makes these simple Almond Joy Cookies a delicious choice for everyone to eat. You can do this recipe in two parts if you are strapped for time. Since this recipe takes a small amount of preparation. I would recommend making the dough the night before you’re ready to bake since. It will help you break up your time. This dough can be refrigerated for a few days if needed. I like making it ahead of time so I can throw these together easily when I feel like a super sweet treat. Almond Joy Cookies are that perfect combination of salty, sweet, and creamy that I crave! Slice the homemade shortbread dough for your Almond Joy Cookies into strips. Make these as big or little as you want. Top with chocolate, chopped almonds, and coconut flakes before adding to the oven to toast. As the chocolate melts, it will cover the soft and sweet cookies for a delicious combination of flavors you can’t get enough of. Each bite of these Almond Joy Cookies are filled with a buttery shortbread cookie crust, sweet coconut filling, crunchy almonds, and a delicious chocolate topping! These are perfect for a special after-dinner dessert, gift for friends and family, or mid-morning snack. Drizzle a bit more chocolate on top for an added touch. Using an electric mixer to cream the butter and sugar until smooth. Hand fold in 1/2 cup of flour, mix well. Fold in the second 1/2 of the flour. Use 1/4 cup of flour on a clean flat surface to work the cookie dough. Dough may be crumbly at first. Turn the dough out onto the floured surface and knead it as you would a bread dough. Cookie dough is ready when smooth. Roll dough into a 3/4- 1" thick rectangle. Cut down the middle and then across into 12 equal "sticks". Place on a cookie sheet and bake for 15-18 minutes or until bottoms are nice and golden brown. Note* Do not underbake or the cookie will be crumbly and fall apart easily. In a microwave safe dish, add the chocolate chips and butter. Heat on high for 1 minute. Continue heating for 20 seconds at a time until melted and smooth. Allow the chocolate to cool for a few minutes to thicken. Carefully cut each shortbread stick in half. Spread a liberal amount of chocolate on the top of each cookie. Press down into the coconut and top with crushed almonds. 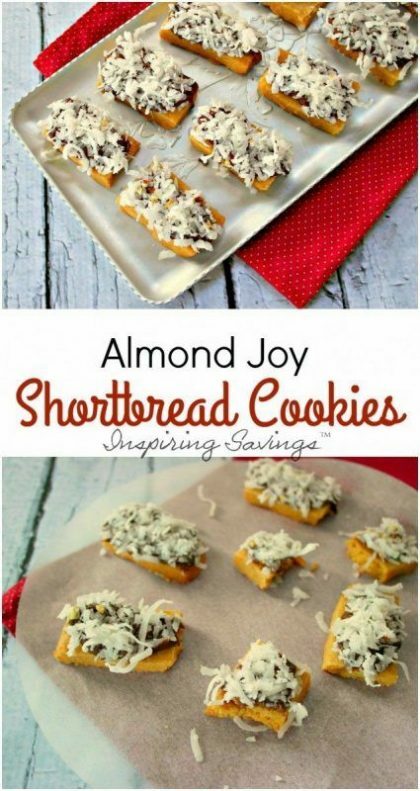 There is nothing as much fun as getting the kids involved in baking, and these Almond Joy Cookies are a great option. Get them to help assemble before baking. This helps you, and makes them feel important! Is this recipe incomplete?? No instructions for chips, butter, coconut, & almonds….? ?